Workshops give people the skills they need to bend willow into whatever they choose to make. There are different workshops throughout the year to make sculptures, baskets and Christmas decorations. The workshops take place in Quenington Village Hall. There is a relaxed and friendly atmosphere with ample refreshments. The price of some workshops includes lunch and a drink in the lovely village pub, The Keepers Arms www.thekeepersarms.co.uk. Some workshops have time for people to enjoy a picnic they have brought with them. Please see individual workshop details for information. All tools and materials are provided. No previous experience is needed however those with previous experience will be helped to develop their skills. Bespoke workshops can also be arranged at the village hall or a venue chosen by you. Please phone or e-mail to discuss your ideas. Make a garden plant support or a small, simple bird, animal or flower in a day. Learn about the types of basket willow and how prepare it for weaving. Practice the different weaves needed to make a simple basket. Get into the Christmas spirit using wonderful willow as a basis for natural Christmas decorations. Make wreaths, garlands, balls, stars and angels. Decorate your willow with hedgerow greenery or cuttings from your garden. 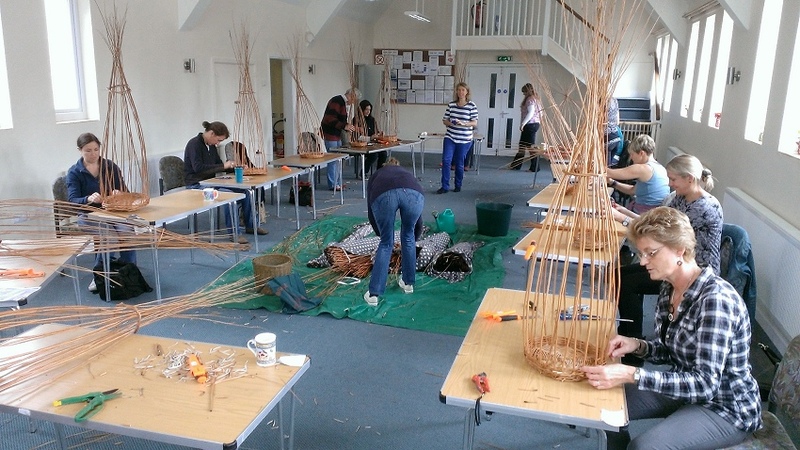 Woodland Learning has made many willow structures, both living and from basket willow. Many of these have been in school grounds. School children and volunteers have been involved in helping to make the structures. Woodland Learning is happy to make anything from willow and especially enjoys school and community projects. Please contact Ruth to discuss your ideas by phone or e-mail..